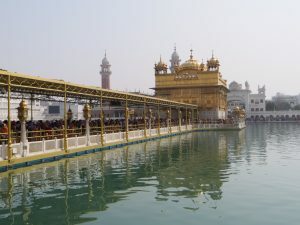 The Golden Temple is the spiritual heart of the Sikh religion. 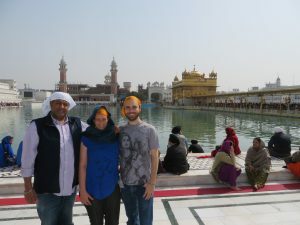 When we went to Chandigarh to visit our friend, Dan, he insisted that we must see the Golden Temple at least once in our lives. The Sikh religion is a reformation of Hinduism, focusing on a return to fundamental values – love, service, and caring for one another. The Sikhs have also been called “the sword of Hinduism”, because of the tradition of training all Sikh men to wield a short, curved sword. Somehow, the fundamental values and the martial prowess coexist. As a result, the Moslem invasions could not subdue this part of India. The Sikhs may well have been the saving grace of the entire Hindu religion. The Sikh empire provided Hinduism with a safe haven during the complex and difficult Middle Ages. Our friend Dan borrowed a car and a driver for the day, so that we could relax and chat during the drive in each direction. It was a feeling of great luxury for us, but it is quite normal in India to have a driver. Not only the super-wealthy have drivers – the middle-class have them as well. With police assistance, we were able to manouevre the car much closer to the front of the Golden Temple. 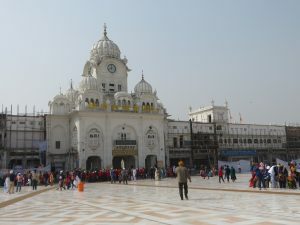 Dan had another friend who runs a restaurant immediately across the square from the front entrance of the Golden Temple. We dropped in there to leave our shoes, rather than leaving them in the massive sea of shoes outside the temple. Jaspar also helped us to affix bright orange head coverings. Next time we will bring slightly more elegant-looking hats! 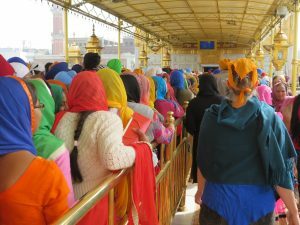 Even though it was cold in the mornings, by the time we reached the Golden Temple it was very hot, much too hot to cover our heads with woollen shawls. We appreciated the cooler option, even if it was bright orange. And then it was time to contend with the queues. 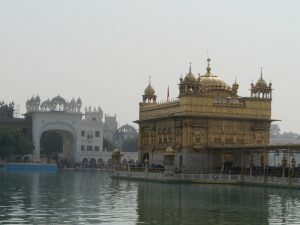 The Golden Temple is in the middle of a large, square lake, with one approach. 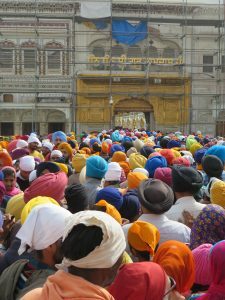 The queues of people wait for hours, inching slowly forward, to finally get inside the Golden Temple. The actual building is surprisingly small! This was Jaspar’s real mission – the traffic management outside was a mere bagatelle, compared with this. We felt slightly uncomfortable as we were ushered along the exit walkway, past the densely-packed queues of patient pilgrims. We are not often in situations of blatant privilege like this. 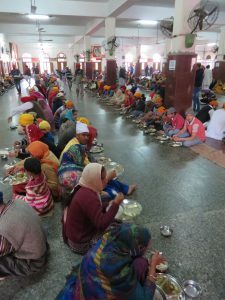 Eventually, we were brought around the back of the Golden Temple to wait with the elderly and disabled, who were inserted into the queue in batches every so often. In the Golden Temple, the Sikh holy texts are read aloud 24/7. The temple never sleeps. When we finally reached the tiny room at the top of the Golden Temple, we were in awe of the atmosphere. We sat and meditated for a while, slipstreaming on the elevated vibration of the place. 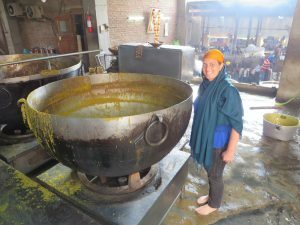 After we made our way out of the Golden Temple proper, it was time to experience the other wonder of the world included on this campus – the community kitchen. 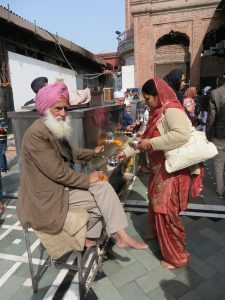 The Sikh religion is very strong on service, and therefore, anyone who comes to the Golden Temple can eat for free. One simply takes a token, joins the queue, and waits for a place in a meal sitting. Each sitting is 20 minutes, and there is a veritable machine of vegetable chopping, cooking, serving, clearing, and dishwashing that supports the enterprise. People queue up for a turn at chopping vegetables or washing dishes. Volunteering is something which brings great merit. We were amazed by the scale of the undertaking. They feed up to 100,000 people per day , or more. The cooking pots were vast, the plates and cutlery uncountable, and the piles of chopped vegetables truly industrial in scale. 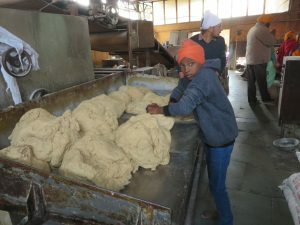 This young lad was wrangling a mountain of roti dough alone when we came by on our tour. The dough is fed into a machine, which does the truly labour-intensive task of rolling out the rotis into circles. Then a conveyor belt carries the flattened dough to waiting group of women around the corner. We took this photo just to provide a sense of scale for this catering effort. That pot reaches almost to Jenny’s shoulder when it is on the burner. Have you ever seen such a huge gas burner? It is like wandering into the kitchen of a giant! When the designated 20 minutes for each sitting is over, the dishes are swiftly dispatched to the waiting hordes of eager scrubbers. We didn’t eat in the community kitchen (too much queueing), but we did sample the chai from the industrial-sized vat out the front of the community kitchen. Instead, we went back to the restaurant which had sheltered our shoes. Ravi and I had heard of something known as an amritsari paratha. Dan had never tried one, but the restaurant had them on the menu. And we were all blown away. Stuffed with spiced potato and cheese, the amritsari paratha was a winner! Thus fortified, we retraced our steps to the closest point the car could reach, climbed in, and set out on the return journey to Chandigarh. 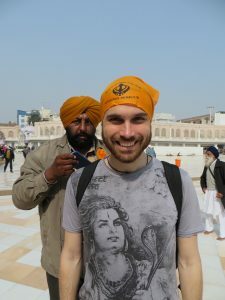 Jaspar told us that Amritsar is very close to the border, and next time we come, we can go and watch the changing of the guard there. We definitely want to come back, and maybe even eat in the community kitchen next time.